I’m on a doughnut binge! First I came down with a midnight craving for doughnuts that resulted in some deep-fry action, then I saw a doughnut pan on sale at Crate and Barrel. I just had to buy it. Anything that makes doughnut making a little simpler is a-ok in my books. I’ve been wanting to buy a doughnut pan for a while but I couldn’t make myself do it. I really dislike buying specialty pans — they always end up languishing in the dark depths of my cupboards. 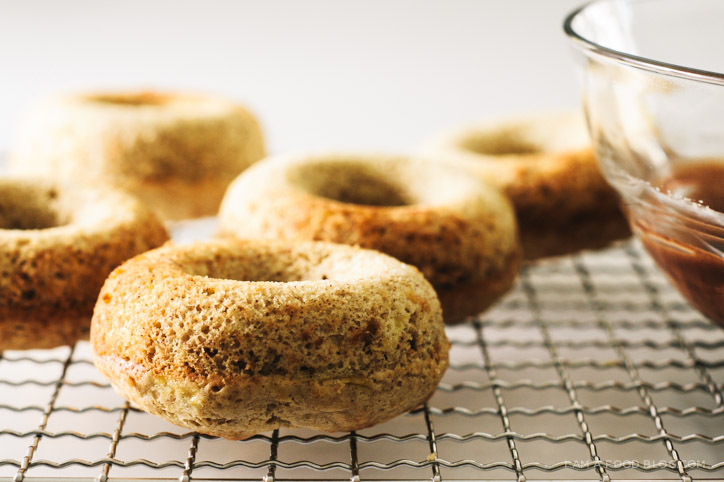 I didn’t think I’d use the pan all that much but after making these banana doughnuts I’m a total convert. I love my doughnut pan! Now that I’ve taken the baked doughnut plunge I can totally picture myself making loads of other baked doughnuts. I was planning on starting with a plain doughnut, but some brown freckled bananas called to me. I adapted one of my favourite banana bread recipes and I’m happy to report that my doughnuts came out light, fluffy and addictive. They didn’t have the crunch you get from deep frying but I actually preferred the texture of these soft, pillowy ohs of goodness. 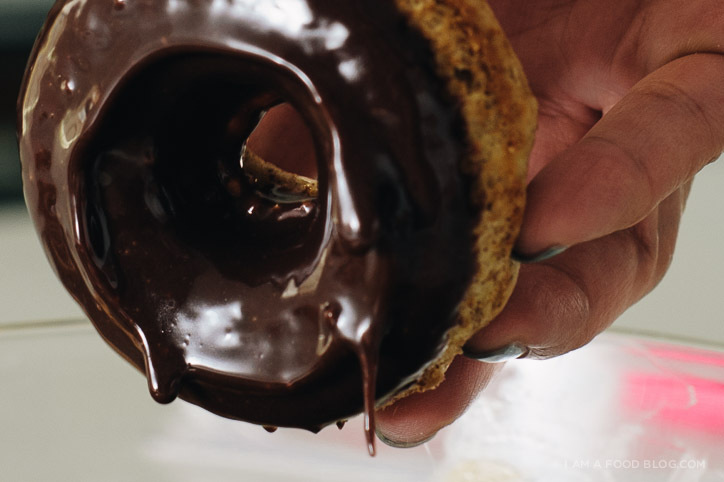 The Nutella glaze took these doughnuts over the top. 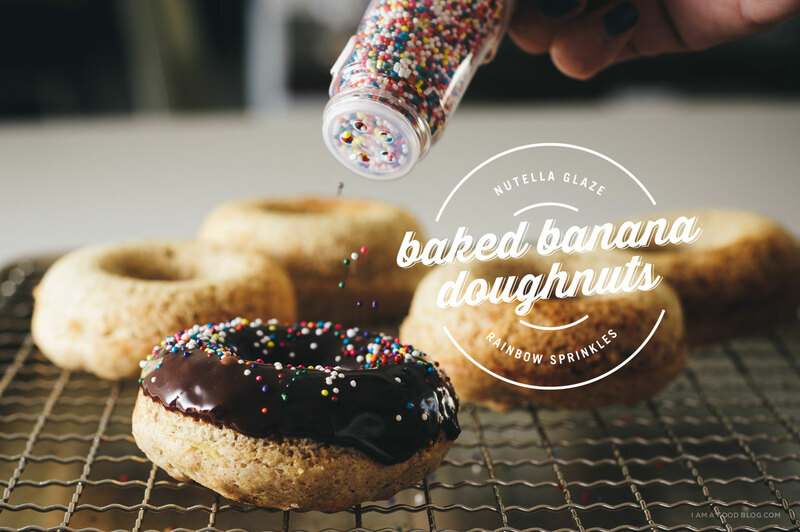 Nutella and bananas are a classic pairing so the glazed doughnuts did not disappoint, especially with the crunch of the sprinkles. 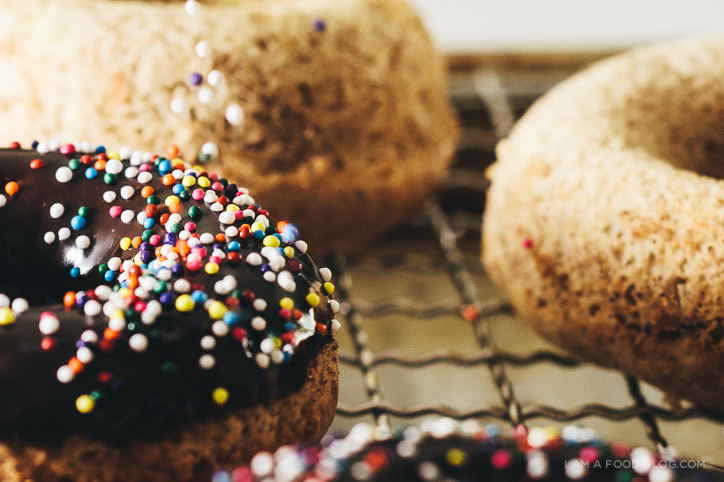 If you’re a fan of naked doughnuts, these doughnuts are just the slightest bit sweet. i am baked, i am wholesome: i am baked banana donut! Preheat the oven to 400°F. 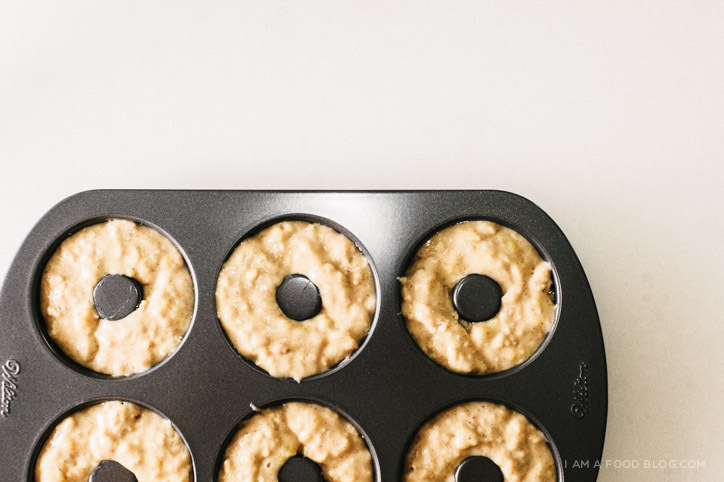 Lightly grease or spray a non-stick 6 count doughnut pan. Whisk together the dry ingredients in a large bowl. In a small bowl, whisk the sugar, egg, banana, buttermilk and vanilla. Add the wet ingredients to the dry and stir until just combined. Fill the pan three-quarters full in each well. Bake for 11-12 minutes, until golden and an inserted toothpick comes out dry. Let cool for 5 minutes before turning out onto a cooling rack. Make the glaze: stir the heavy cream into the Nutella. If too thick, add more heavy cream 1 teaspoon at a time. Once the donuts are cool, about 20 minutes, dip in the glaze and top with sprinkles, if desired. These sound awesome! 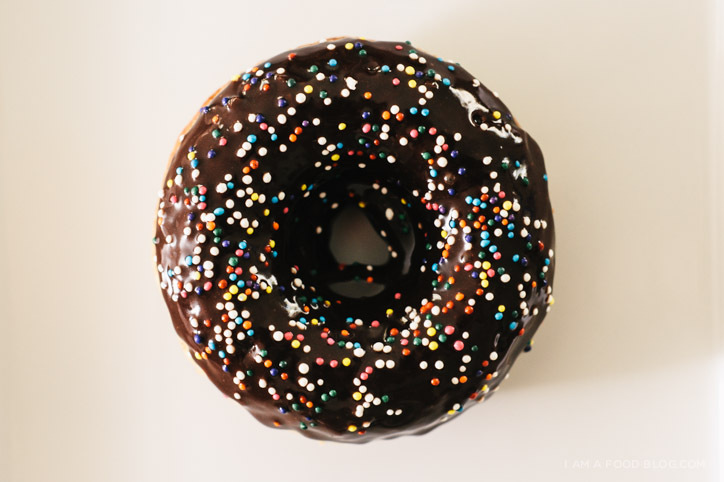 I love a solid baked donut, and sprinkles just make everything better! omg need. need so much. I am loving the updated look for your site. And all these donut recipes are just the icing on the cake. Oh my GOD. You are seriously my favorite. Wow, these look and sound awesome! Love the video of you sprinkling the tops! Hi! These look amazing! How is the batter/dough? I’m wondering if these can be made without the doughnut pan? I do have mini bundt pans that would work if the dough is very liquid-y. The dough is pretty thick, but I think it would work in a mini bundt pan. Let me know if it works! We seem to think alike. I just ordered donut pans that will arrive in two days. I was going to make an ordinary donut using their recipes but I saw some brown bananas and thought maybe I could use a banana bread recipe. I looked up banana donuts on google and your blog came up. They look incredible and I can’t wait to try it. I’m glad that you have worked out all the glitches as far as what temp and how long to bake them. I also never would have thought of the nutella frosting but it sounds genius! Thanks. I bought a doughnut maker on sale after last Christmas–It’s even better than a doughnut pan!No heating the oven and it takes 5 minutes to have warm doughnuts once the batter is mixed!I hear you when it comes to specialty pans(and appliances), but this was well worth the 10 bucks I spent and is a fav at our house today!Can’t wait to try the recipe! just popped a batch in the oven cant wait……..cupcake and muffin tins are gathering dust in the back of the cupboard. Doughnut tins are the new black! I have recently purchased not one but two! Doughnut pans. 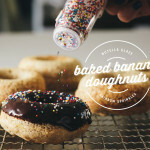 I have some ripe bananas and cannot wait to make these doughnuts. Thank you for sharing your recipe. That sprinkles gif just made my day. These donuts are AWESOME! Light, airy and fluffy and definitely can taste the banana although it is a subtle banana taste. We followed it to the “T” and VERY easy to make – my husband did ours because he is the baker in the family. This recipe is a keeper and I’m going to purchase the cookbook. Thanks so much for sharing your recipe. These were amazing!! Thanks for sharing such a delicious recipe.